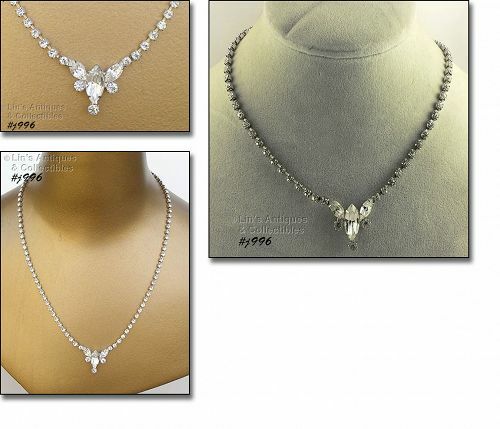 Another beautiful clear rhinestones Eisenberg Ice necklace in this listing! Necklace is silver-tone and measures 16” in length. It has a snap lock (fold-over) clasp. The rhinestones are round shaped. The focal point on this one is a grouping of 3 larger clear round rhinestones that have 3 rhinestone “dangles”. These rhinestones are the same size as the ones in the necklace. This focal point is 1” in length. 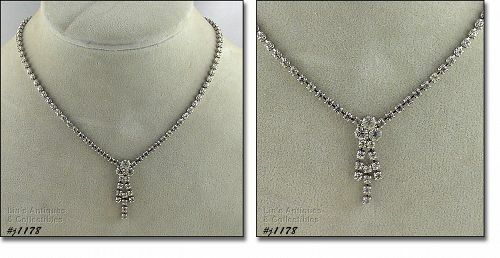 This Eisenberg Ice listing has a beautiful rhinestone necklace! It measures 16” in length and is silver-tone with clear, sparkly rhinestones. The necklace rhinestones are round shaped. The focal point is a center marquise shaped clear rhinestone surrounded with 5 round clear rhinestones. 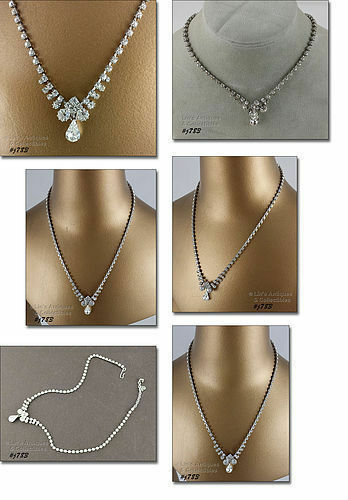 All rhinestones are prong-set and necklace has a snap lock (fold-over) clasp. This listing has a vintage Goldette intaglio cameo! This Goldette necklace is a little different than usually found in that it has 4 gold tone chains with one chain having a gold tone locket and one having an intaglio cameo. The longest chain measures 30”, next is 28”, next is 24” with locket, and shortest chain is 20” with intaglio cameo. 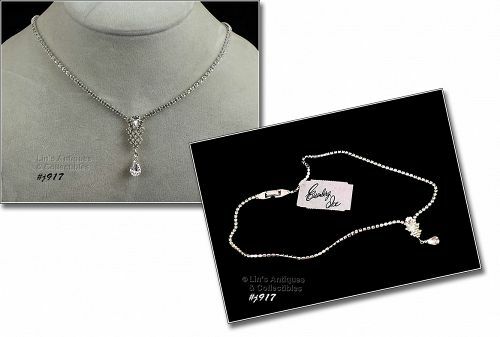 Wow – sparkle, sparkle, sparkle -- this Eisenberg Ice necklace is perfect for a wedding, a prom, a party, or to add some spark to a shirt and jeans! Necklace measures 16” and the pendant dangle is 1 ¼” long. All rhinestones are prong-set! It is not marked but has the original Eisenberg Ice tag. 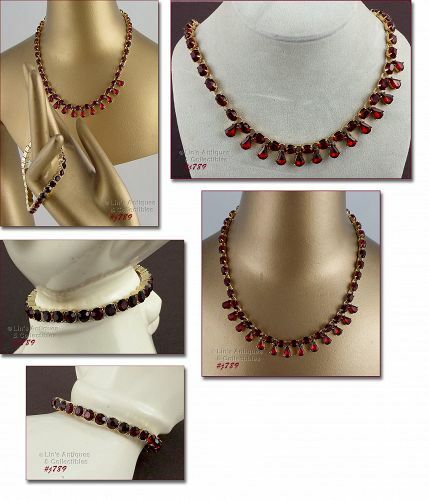 AVON RED RHINESTONES NECKLACE PLUS A FREE BRACELET!! 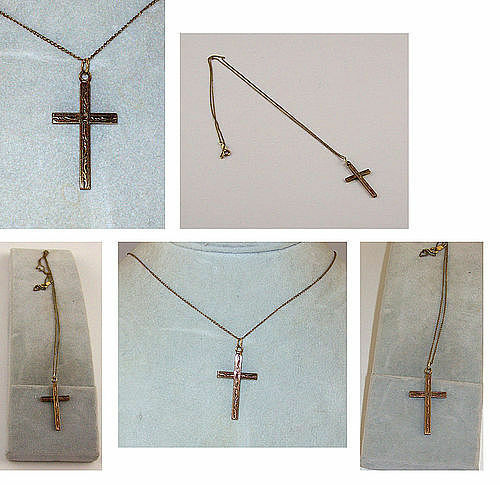 This listing has an absolutely beautiful Avon necklace! The rhinestones are a rich red color and all are prong set – excellent quality and workmanship! Necklace measures 18 ½” at longest and can be worn at a shorter length by clasping closure in different links of the chain extender. Necklace is marked Avon. This listing has a beautiful Eisenberg Ice necklace! It measures 16” with a 2” extender. All rhinestones are prong-set with lots of sparkle. Necklace is marked Eisenberg Ice. 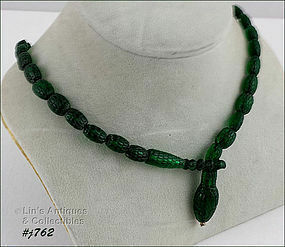 I purchased this unusual necklace over 30 years ago at an antique shop! The necklace intrigued me but I could never bring myself to “wear” a snake around my neck so it has been in the jewelry drawer of my dresser all these years. I still find it intriguing but it deserves to be appreciated so I am listing it for sale. This is another lovely pendant! It is a light gold topaz color intaglio cameo on a gold tone 24” chain. A while ago, I had one like this except the cameo was a pale purple color. I know that this is not the original chain for this cameo because the pendant is a Goldette production and Goldette was always stamped on the chain with no markings on the cameo itself. 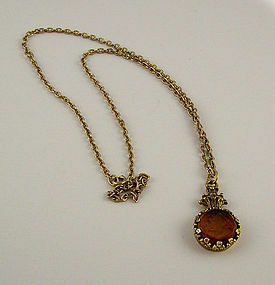 This is such a pretty costume necklace – it has a vintage/antique look and style! The styling reminds me of Avon but I could find no marking. 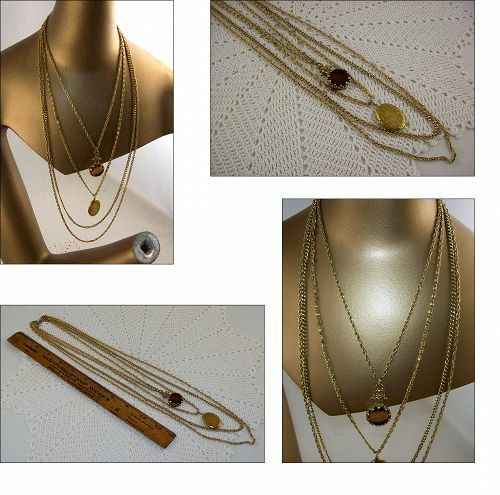 Necklace measures 16” with a 3 ½” chain extender. The pendant is an additional 1” in length. Very nice with lots of detail! 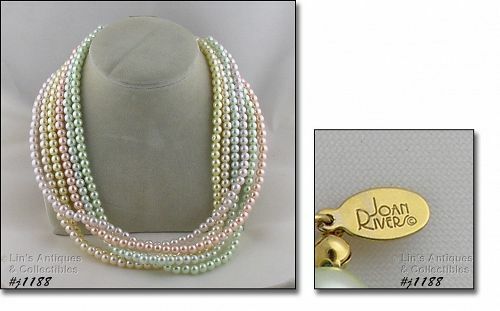 I love vintage faux pearls and for a long time, I collected them! I am listing these 3 as your choice and each one is lovely. The first one measures 16 ½” in length and has a silver-tone push and pull clasp that is stamped Japan. 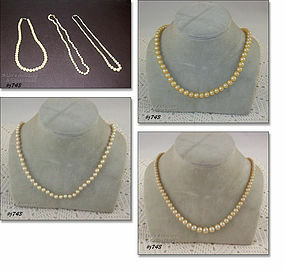 The pearls are the same size (7mm) and have a gorgeous luster. 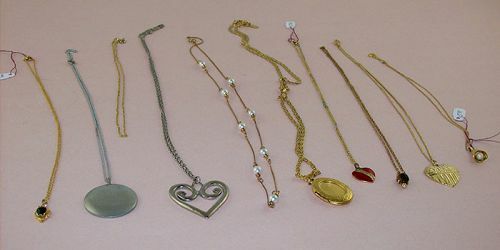 I am listing several lots of vintage costume jewelry that had been for sale at a local antique shop.